YANGON, Myanmar (CNN) -- Myanmar's pro-democracy leader Aung Sang Suu Kyi lost her latest bid for freedom Friday after a court declined to overturn a sentence of house arrest. Aung Sang Suu Kyi was sentenced in August for breaching the terms of her house arrest. The Yangon Divisional Court's decision means Suu Kyi, 64, will remain under confinement at home, serving out the 18 months added in the summer to her existing detention time. She was sentenced in August for breaching the terms of her house arrest after an incident in May in which an uninvited American, John Yettaw, stayed at her home. The opposition leader had told the court she didn't know Yettaw, was unaware of his plans to visit, and didn't report his intrusion because she didn't want him to get in trouble. She appealed her sentence on grounds that it was unwarranted. 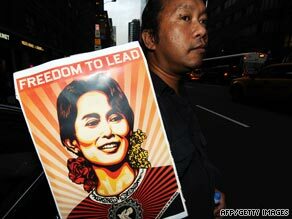 Suu Kyi, a Nobel Peace Prize laureate, has been confined in her house for about 14 of the past 20 years.